FINGERPINT PENDANTS – each one is as unique as the person who’s print is used to create the pendant. Are you looking for a way to keep the ones you love close? Something that is unique to you and them? Fingerprints are unique to each and everyone, no two are the same. 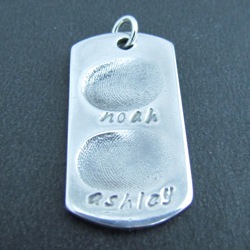 So imagine wearing a pendant with your child’s, partner’s, parent’s or even grandparent’s fingerprint on it. What a hugely personal way to remain connected and to keep them close to your heart. 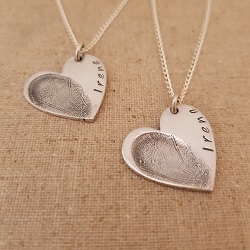 With such personal detail, fingerprint pendants make a truly gorgeous keepsakes that you will treasure forever. Created in a Sterling Silver “clay”, the fingerprint in placed directly into the clay which is then shaped and fired. During the firing process the clay burns away and the Silver fuses together creating your final piece. Therefore your pendant is created from the very piece that was touched by the one you love. WHAT SHAPES DO THEY COME IN? There is also the option of a rectangle and/or Dog Tag shape and cuff links. However because the pendant starts out as clay, we can shape it almost any shape you would like. Due to the nature of the creation process, these pendants are currrently only available to those who live in Auckland. To create a pendant we will need to organise an appointment for you to visit me in my home studio, or for a travel fee, I can come to you. 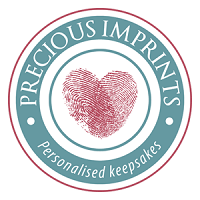 Please contact me for further information at jo@preciousimprints.co.nz .